Greenport has been missing a little bit of history all winter without the FDNY fireboat Fire Fighter tied to the pier near the ferry to Shelter Island. 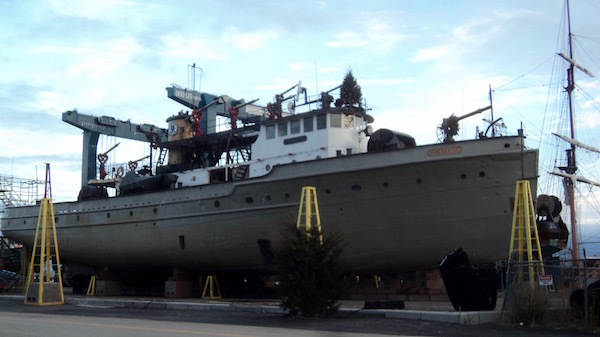 But by the time you read this, Fire Fighter will soon be on its way back to its home berth with a fresh new coat of paint, after a winter spent undergoing a major overhaul at Goodison Shipyards in Rhode Island. 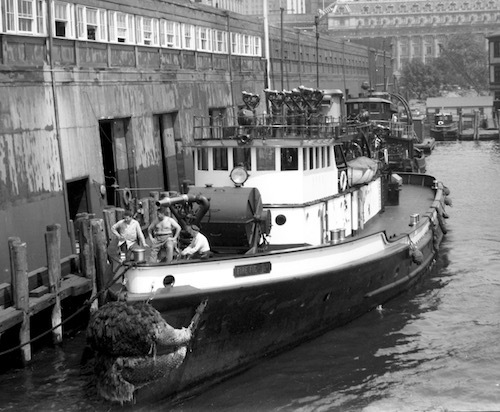 The fireboat, launched in 1938, had been in service to the New York City Fire Department for 72 years when she was replaced in 2010, and was headed for the scrapyard when a crew of firefighting buffs rescued her, with hopes to turn the storied vessel into a floating museum, just after Superstorm Sandy in 2012. She arrived in Greenport in February of 2013. When the boat was hauled out of the water on Jan. 10, shipyard workers found just a few bars left of its zincs, sacrificial pieces of metal bolted to the keel to absorb electrical current and protect the steel hull. “For a long time, it was unprotected from electrolysis,” said Mr. Ritchie. Like many major community projects in Southold Town, bringing Fire Fighter to the shipyard was made possible with quiet backing from Southold and Greenport IGA owner Charles Reichert, said Mr. Ritchie. While the fireboat’s foundation received a $414,00 grant to repair the boat from the New York State Office of Historic Preservation, and an $80,000 from the U.S. Department of Interior’s National Heritage Program, those grants are dependent on the the non-profit paying its bills and then being reimbursed. Mr. Reichert agreed to provide a bridge loan that is allowing the non-profit to pay the shipyard up front. He has also offered to match up to $50,000 to help the all-volunteer organization with its operating budget once the overhaul is complete. “We budgeted close to $480,000 (for the overhaul) and we’re right on track,” said Mr. Ritchie. With the majority of the funding for the project coming from New York and federal historic preservation offices, Fire Fighter’s board of directors decided it was important to do a historically accurate restoration of the boat as it looked when it was first launched. 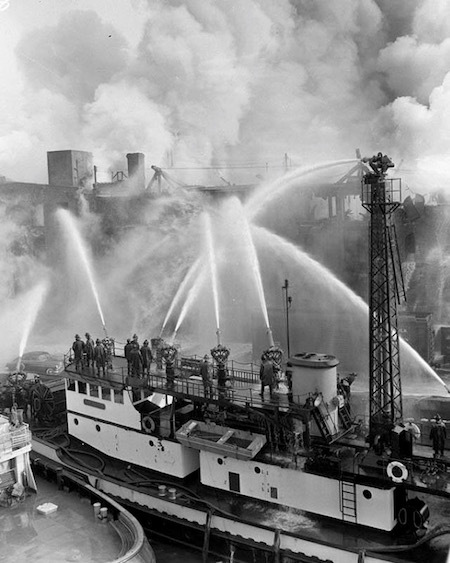 At the time, fireboats working in New York had a black and white color scheme, not the red that the fireboat was painted when it was decommissioned. Mr. Ritchie said the fact that the boat was designed by noted naval architect William Francis Gibbs was a major factor in helping the museum receive historic preservation grants for the overhaul. Mr. Ritchie said some on the museum’s board are in favor of the eye-catching red, which fits with the public perception of what fire apparatus should look like. 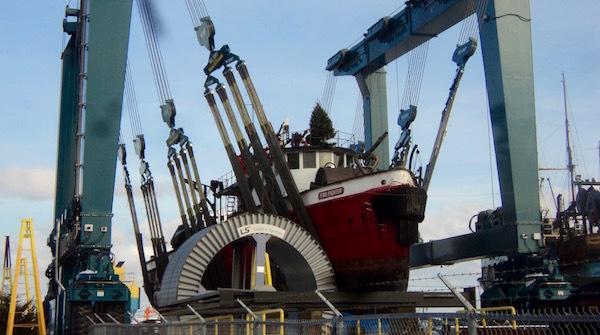 “If it doesn’t work out, next time we go back to the shipyard, we’ll paint it red,” he said. Fire Fighter was being prepared for relaunch and sea trials as The Beacon went to press, and Mr. Ritchie said he plans to be back to Greenport and welcoming visitors by early April. The boat has been berthed at the commercial dock owned by the Metropolitan Transportation Authority at the terminus of the Greenport railroad line for more than three years. Greenport Village leases the dock from the MTA, then subleases space to the fireboat. The museum only has a month-to-month agreement, said Mr. Ritchie, but he is heartened by Greenport Mayor George Hubbard’s support for the boat to stay there, despite occasional rankling from some in the village who would like to see the fireboat gone. With the major overhaul under their belts, Mr. Ritchie said the museum’s board is now focusing more attention on handling the day-to-day operation of the museum. Mr. Ritchie said he’d also like to be able to have weddings and private parties on the boat, perhaps offering a sail on Saturdays during the tourist season. But there are a couple hurdles to making that happen. First, the fireboat has a diesel electric engine, and “a lot of guys trained in the engine room today don’t know that kind of operation,” said Mr. Ritchie. Another issue is that, as a work boat, the fireboat is not designed according to Coast Guard specifications necessary for passenger vessels. While the museum has a core group of about half a dozen active volunteers, Mr. Ritchie said he finds that people who are active in volunteer fire departments on the East End often come by, get bitten by the fireboat bug, and then overextend the commitment they can realistically make. “I’m hoping with the restoration there might be more people interested,” he said.